Vita, the Champlain Monster, a whale of a tale told by Edward James Wildblood 1927-2002. 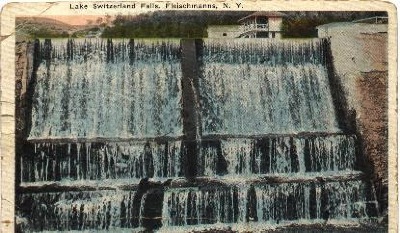 Ed had secured the American border with Mexico and Canada and did not allow the creature to reach the Vermont shore where the Wildbloods lived. 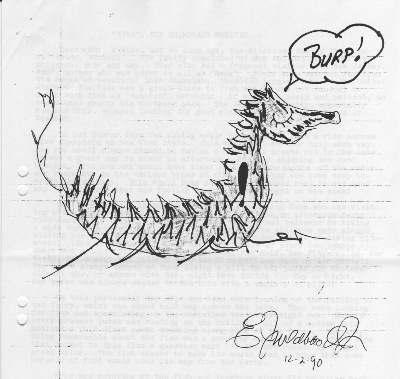 The beast, which had evolved from a well-fed perch in the "course" of one year, winked at Ed's son Eric and returned to the deep with much aggravated indigestion after devouring the New York half of an interstate ferry. 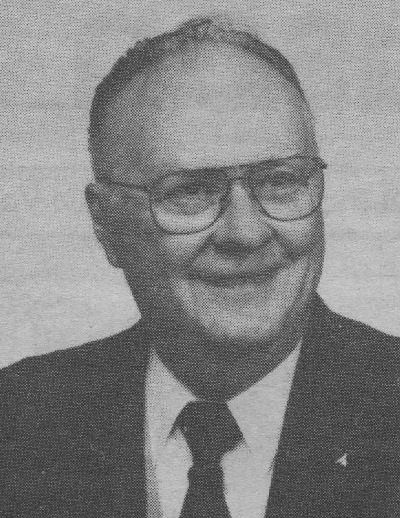 The cartoon artist and author of the above story was Grand Master of Freemasons in the Green Mountain State. 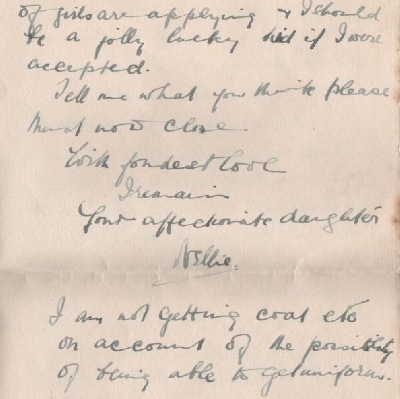 During his contacts with the webmaster and other family history researchers, Ed expressed his hope of finding a Wildblood lodge member in the United Kingdom. 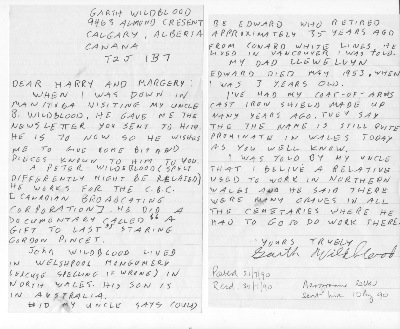 The following letter was sent by Garth Edward Wildblood (1950-1997) to researcher Harry Charie in 1990.The uncle in Manitoba he refers to was Robert Thomas Wildblood aka Willblood (1920-2013). The son of John then living in Australia was Denzil (1927-2004). 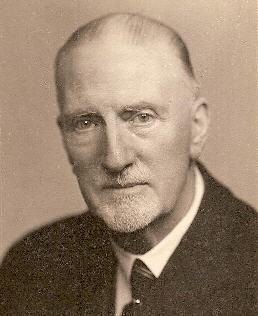 Denzil's father was John William Wildblood (1906-1987) of Meifod and Oswestry. 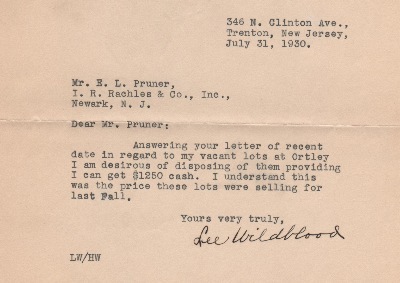 The Conard retiree was actually George William Wildblood (1888-1972) from Leeds. He and Peter Wildeblood are not (yet) related to Garth. 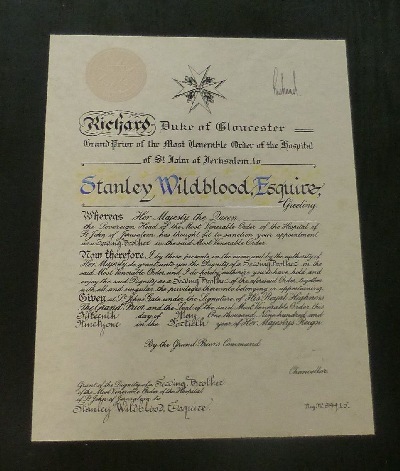 This cherished certificate awarded to Stanley Wildblood 1926-2004 on December 5, 1991 for service to the Order of St. John is preserved under glass on the wall of his daughter Carol Greenaway in Brierley Hill. Here Stan is shown with wife Ruby holding the breast star medal associated with the honor. We are told that serving in this worthy organization ran in the Dudley Family. 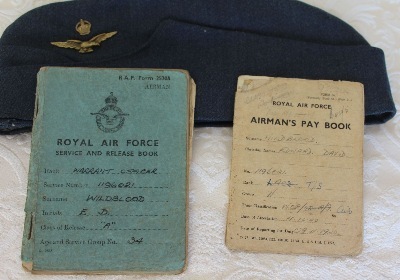 First page of the Royal Air Force Observer's and Gunner's Flying Log Book belonging to Edward David Wildblood (1920-2015). 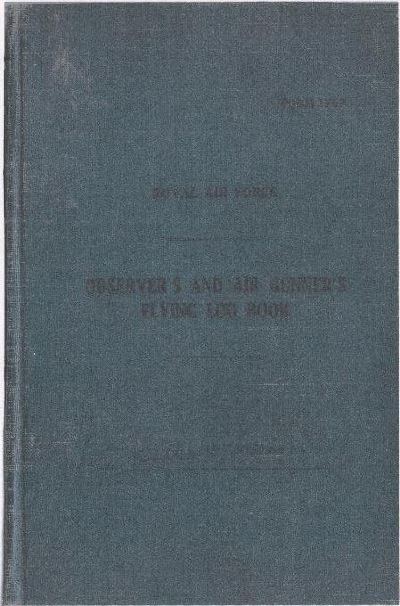 The cover of the volume is shown below the 1941-1944 entries. In case you are unable to read what is written on the cover, it is "E D Wildblood." The entire log book was scanned and contributed by Ted's family living in Portugal in January 2016. More on the observer / gunner is found in a October 2015 News entry. was attending to war wounded. Nell was a beginner in nursing but already an accomplished pianist and vocalist, having studied music in Bonn before the outbreak. 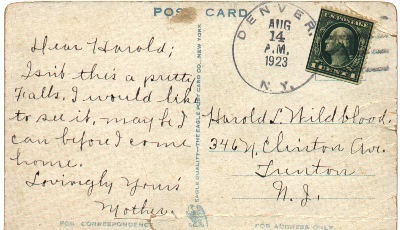 Nell never went to war, instead raising four children, but her future husband, Percy "Jimmie" Hines, served twice in France. More about Percy and Nell can be found under "News." 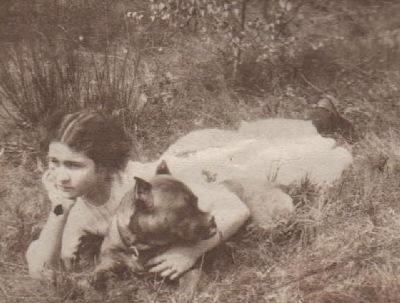 To give your war-weary eyes a peaceful rest, here is a picture of the writer of the letter above and the one below, Nellie Wildblood of Trentham. This page, distributed too small to read in the 2010 Wildblood family newsletter, shows that Nellie troubled her pretty little head about more things than just oppressed Serbia. 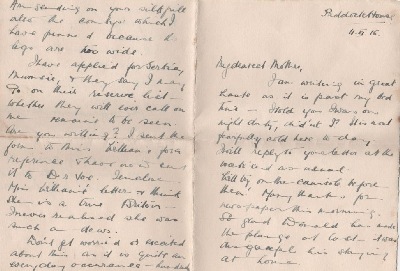 Writing home in 1915, she serves as an inspiration to us all in vowing to explore family roots, Vernon not Wildblood, in Normandy. to archivist emeritus Harry Charie. We thank this chain of preservationists for guarding the treasured memories of "a flower that had just begun to unfold." 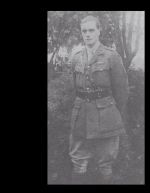 No photo of Edmund or Dinah is known to exist, but here is Charles as a Great War chaplain. Before and after the conflict he served 14 different congregations, starting in Malmesbury in 1883 and retiring from Clayton-le-Moors in 1930. Charles' first wife was Marian Barrs 1857-1925. Her grave was found recently at Low Moor, Bradford, where Charles preached from 1909 to 1913. The pastor predeceased his second wife, Florence Lamb, "passing triumphantly home" from Timperley. His grave is at Ipsley churchyard, Redditch. was born in the Old Country and the owner of the North Clinton Avenue residence, where tools were sold to the many potteries in the East Trenton neighborhood. Hannah did not allow Rider College student Harold to harbor the infernal machine manufactured by Remington and he had to keep it at a low key in the attic. Perhaps the elderly lady was right about the typewriter being the devil's tool. The Ortley Beach properties would be worth millions today. Lee was the grandfather and Harold the father of the website author. Deprived of coastal breezes and maritime picnic sites, the signer, Lee, was thereafter compelled to roast his hotdogs and fry his burgers in the sweltering inland city. Here is the rebellious teenage typist earlier that same fateful year in the Trenton High School yearbook. It would appear that Hal was 472nd in his graduation class, but his secretarial skills surely ranked far higher. 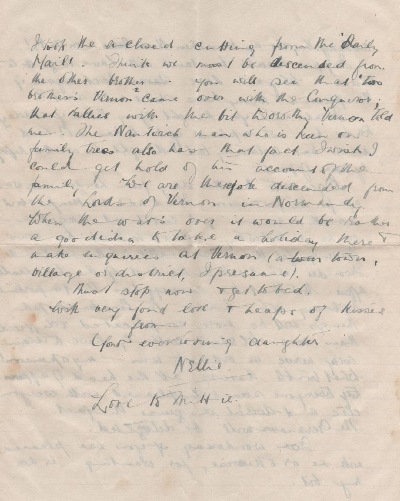 This 1913 letter from EdwardHarold Wildblood 1878-1926 to Charles Stanton Wildblood 1868-1948 illustrateshow isolated Wildblood households were even as recently as 20 years ago, beforethe Internet brought distant cousins close together. The captain who served inIndia was not the only one who thought his immediate family comprised all theWildbloods of the world and feared the name would become extinct. 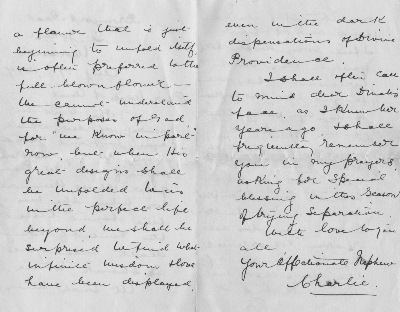 This letterand the portrait of Charles under the letter are courtesy of the jam maker's grandson, Michael Checkley. Until checking with the website author, Michael did not know the relationship either. 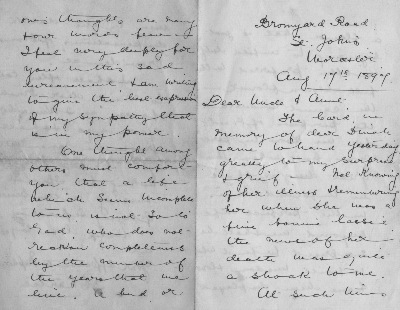 The letter writer and the recipient are actually second cousins, both having William "the Engraver" and Dinah Wood of Burslem as their great grandparents. 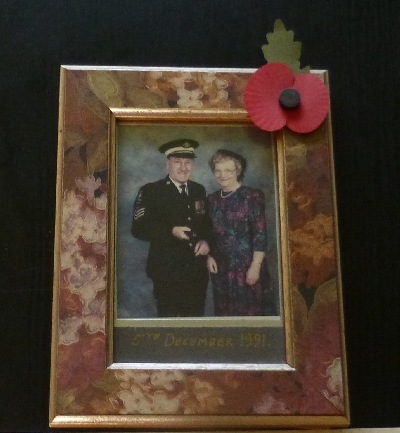 My search for a photo of the sender only yielded a family portrait furnished in 1999 by his grand nephew, Peter Goldney. Sadly, Peter died before he could be asked whether he had an adult portrait of E. H.
in a thumb cropped from a family portrait furnished a decade ago by the late Peter Goldney. Our journey leads to Leeds. Staffordshire natives came to the West Yorkshire metropolis as potters but made their mark as stationers and brought home the bacon in the sausage trade. Throughout the 1890s Leeds Wildblood families were prominent in Liberal politics and mission organizations of the Methodist New Connection. More on these folks and their conclusions are forthcoming. But what were the names of the curly cuties that proffer the sign on the vintage takeaway bag? Porky and Butch? Pleased to meat you! Sammy and Eddie? Wildy and Limey? Kirk and Mark? Perhaps a descendant recalls their names from family lore. And was the bag printed by Wildblood & Ward? Feedback is solicited. Don't make me ham it up alone! This sad news was published in the Barnsley Chronicle. Horace died on October 2, 1943, in Tunisia. His widow, Winifred May née Richer, passed away in 2000. The daughter born while he was overseas, is Dawn Cross née Wildblood. 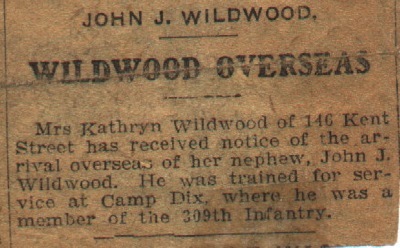 refers to John Jackson Wildblood, not Wildwood. 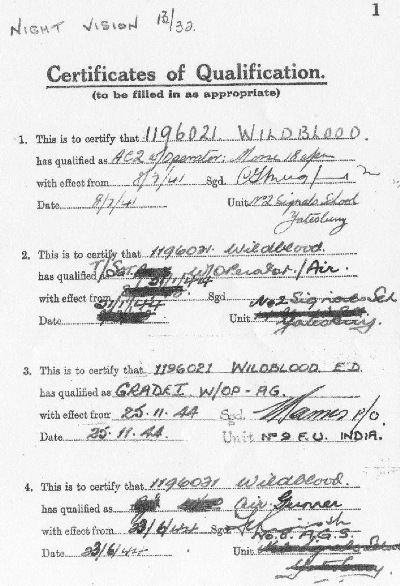 Earlier posts of Wildblood documents are available for readers who found us after May 2006.